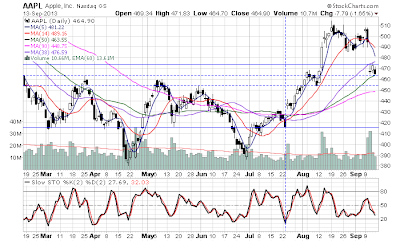 Apple is getting oversold. Its about to get oversold enough for a bounce. 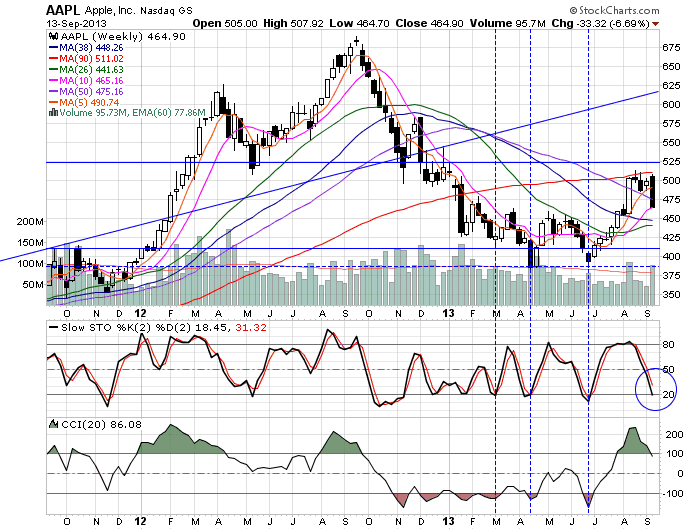 Short-story, the current pattern is to buy AAPL when the weekly Slow Stochastic is near or slightly below 20. The long-story, last year's massive decline obviously created a new trading pattern. 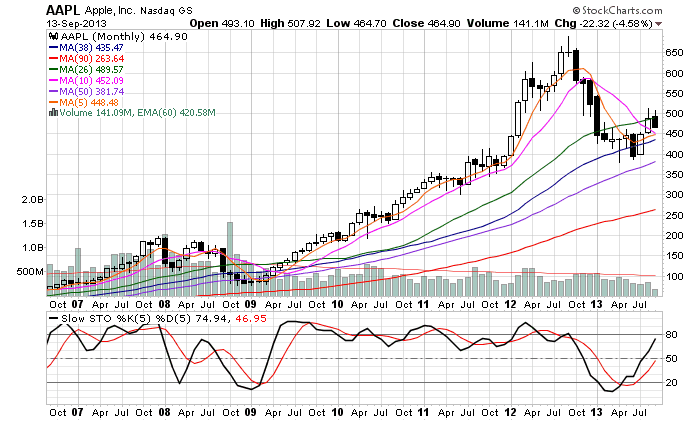 The wash out was witness via the monthly chart approaching very over-sold conditions via the Slow Stoch. 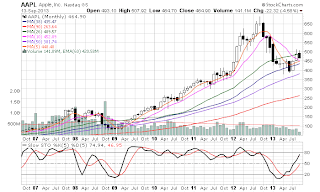 Upon achieving this oversold condition, the stock fundamentally changed. 1. The massive buyback was announced and being executed. 2. The street was re-conditioned via their expectations (to tone down the out-of-whack numbers). 3. 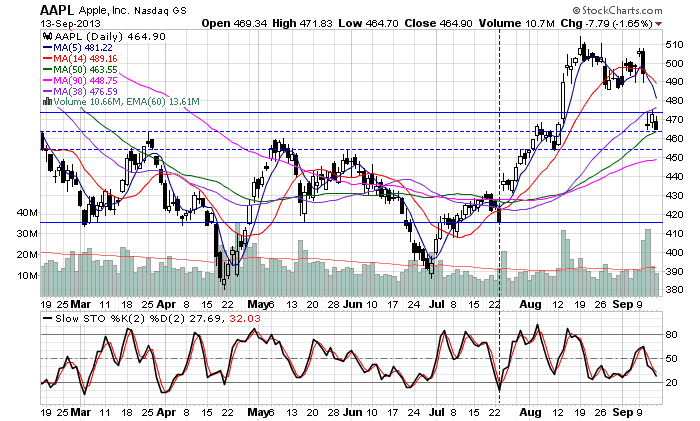 It became acceptable to buy AAPL again. Numerous big name players entered the game. 4. 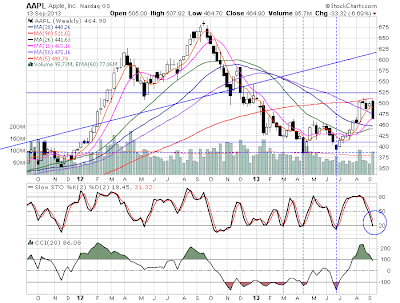 Last quarter's report suggested Apple management is in control of the street's expectations again. Also, many analysts are ignoring the affects on margins w/the current iPhone strategy. New, more inexpensive process for the 5C and already established process for the 5S. In Apple's 1st quarter, margins may very well approach 40% again. Handedly beating the street's expectations. 1. Ignorant media looking for page views. Negative chatter will bring down the stocks.